I began quilting 13 years ago…unlike some art quilters, I came at our niche via some very traditional patchwork quilting. I smile as I look though these catalogues, whose every page used to tempt me. In my gallery-of-regrettable-fabric-purchases, I have too many flowers and little cats and miniature musical instruments…and, my personal low, “cows on vacation.” Yep, 4 yards of it…although, by way of alibi, it was actually chosen by my then-12-year old. Then I discovered batiks! I was in love. Of course, this resulted in a collection of fat quarters of multi-colored, highly patterned fat quarters which I may never use…they sit on the shelf in my studio like members of a very loud and boisterous family. Experience brings wisdom and -for me- an acquaintance with hand-dyed fabric. 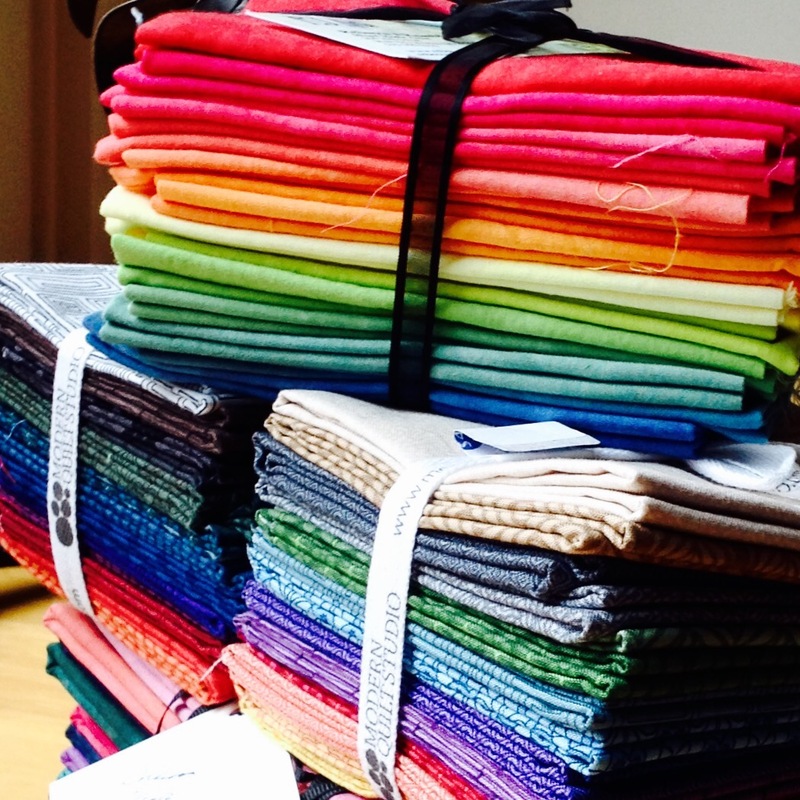 This rainbow stack of fabric is now my paintbox. Blender batiks play nicely, too, as do shot cottons. My purchases of patterned fabric are now extremely rare…I still fall in love, but wisely now (Victoria Findlay Wolfe, Weeks Ringle, Lynn Krawcyk, Janine Vangool…certain artists’ collections just sing to me). Ok, ok, Christmas fabric does NOT count ;). A similar theme has played out in my thread drawers (wild variegateds yielding to a much-too-large collection of solids for my longarm) and notions (out with unused gadgets, in with the Tsukineko inks). For me, the evolution is due to years of issues of Quilting Arts magazine and some spectacular teachers. What about you….does your stash tell the tale of your journey? This entry was posted in Uncategorized on January 8, 2016 by neonkittyquilts.